… and I had to pick my jaw up from the sidewalk. That’s right, y’all. Your eyes are not deceiving you. This place serves up a hot dog for 12€ ! That’s over $15.50 for a … HOT DOG! All I can say about that, mon pote, is that there had better be a damned Kobe beef hot dog in that bun … or come with shaved white truffles and foie gras. Apparently for some, the cachet of an American dog is worth spending that kind of dough but, seriously folks, are you aware of what actually goes into a hot dog? That wasn’t the biggest shock on the menu, though. The thing that really made think me I was being punk’d was the price of the bagels: 13,50€ ?! “A $17.50 bagel? !” I exclaimed (inside my head). For that price, they must have been imported from Brooklyn that very morning, right? Upon closer inspection, I did notice that the menu said “BagelS au saumon fumé,” BagelS au bacon,” “BagelS végétariens,” and “BagelS pastrami” so maybe — just maybe — you get two … three … four? After snapping this photo to post on Facebook and shock my American friends, I glanced inside the restaurant and noticed that there were three waiters milling about … but no customers. At 12:30 pm in the Latin Quarter? “Hmm. No wonder,” I thought, “with those prices.” If I hadn’t already eaten a $5 halloumi sandwich from the Lebanese place around the corner, I might’ve been tempted to step inside and sample that $17 vegetarian bagel (or bagel trio). Or maybe not. According to one review, though, the burgers are worth the price. 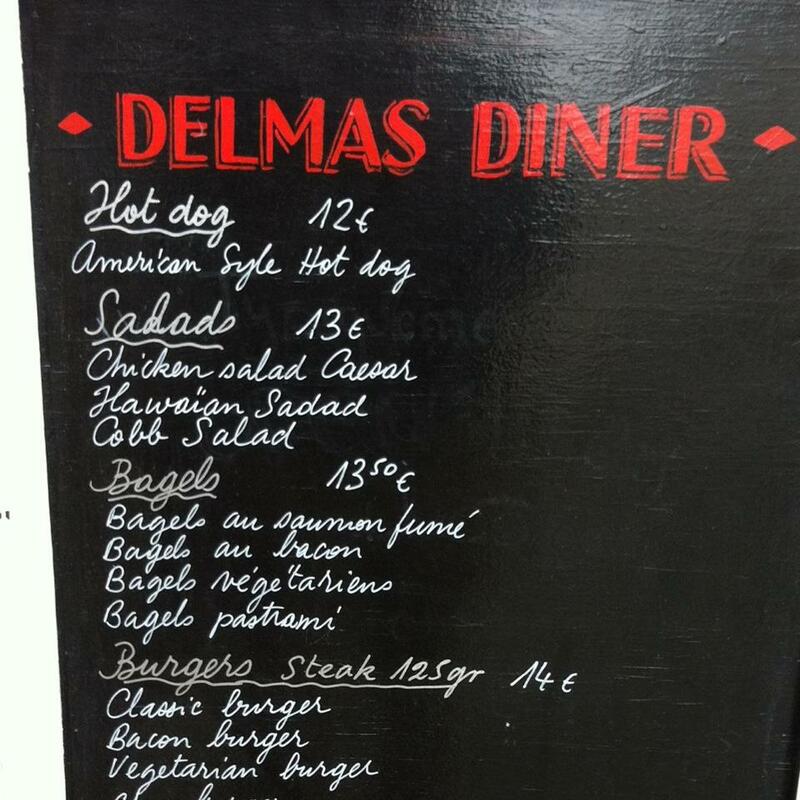 So if Michel and I are in the neighborhood one afternoon and he’s jonesin’ for an American-style burger or … <gulp> … a $15 hot dog, maybe we’ll stop in at Delmas Diner and I’ll give the place a proper review. There is an $18 veggie burger on the menu, after all. In the meantime, I think I’ll stick to my budget so I can pay that $60 phone bill at the end of the month. Crazy, isn’t it? I noticed the menu is mostly in English…trying to attract the tourists? As you said, there are lots of less expensive places to eat in the Latin Quarter. Quite probably, Jeannette. In fact, if I’m not mistaken, Delmas Diner is in the space that was formally Katz’s American Diner. (There are many American-oriented establishments in this particular corner of the Latin Quarter … not far from Mouffetard.) One thing is sure, they have upped the prices! I remember thinking that about prices in France TWENTY years ago!! I’m in California right now and I laugh whenever my sister in law reminds me what they paid for their 1,000 sq ft one bathroom house. My biggest splurge in Rennes in 1994 was the new REM CD which I think cost me about $20 at the time. I do wonder if those are Latin Quarter Paris prices! Though I’ve seen 14-euro burgers no problem here in Poitiers (and I did use to find that expensive), I get a bagel for 3,50 and a croque monsieur for 4,50. I’m often still shocked when I go to Paris. Cocktails here cost 5 to 8 euros, and Chipotle probably wouldn’t last with their 10-euro burritos (though they are so good…). Definitely Latin Quarter prices, but ON STEROIDS!